Brown and white cowhide, imported from South America. 6616 to arrange a viewing. • Open seven days a week. • Chromium-tanned first class South-American cowhide for longevity and durability. 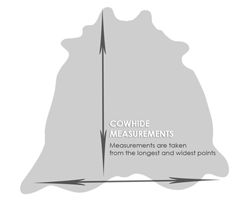 • Unique rug as individual as your fingerprints – no two cowhides are ever the same! • Photograph is the exact hide you will receive. • Customer satisfaction is our number one priority. Easy no-questions asked return policy.